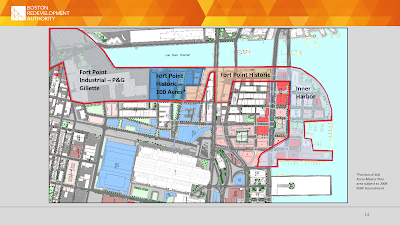 In February, the City of Boston initiated a planning process to renew and amend the South Boston Waterfront District Municipal Harbor Plan (South Boston MHP). The intent of the planning effort is to facilitate the redevelopment of the parcels at 150 Seaport Boulevard and update the South Boston MHP with the numerous planning initiatives and City policies related to the planning area that have developed since the plan’s approval in 2000. The planning effort will be administered by the Boston Redevelopment Authority, and developed in conjunction with a harbor planning advisory committee that will meet at regularly scheduled public meetings through the winter. The renewal and amendment process will be guided by Chapter 91 of the M.G.L. and 310 CMR 9.00, the Waterways Regulations, which govern new development and uses along the state’s coastline to protect the public’s rights on private and Commonwealth tidelands. The Commonwealth recognizes that each harbor is unique and encourages municipalities to develop comprehensive plans, in accordance with 301 CMR 23.00, the Harbor Plan Regulations, that are tailored to their own objectives and also consistent with state tidelands policies. As harbor plans are long-term, active planning documents the regulations have provisions for renewal and amendments to accommodate changes to development programs and local policy and planning goals. 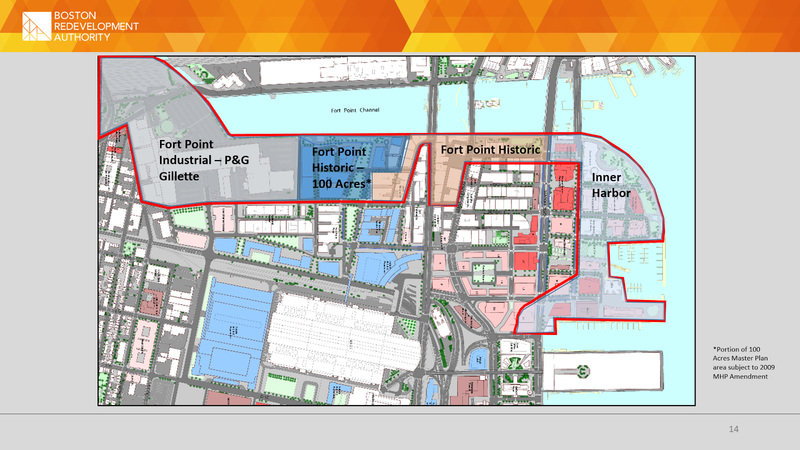 The South Boston MHP renewal will comprise the entire 108 acres of the South Boston MHP planning area, with a single-site amendment for the parcels at 150 Seaport Boulevard, where the Whisky Priest and Atlantic Beer Garden establishments are currently located. When the South Boston MHP was being developed in 2000 these properties were some of the only active businesses in the planning area, functioning as water dependent seafood markets up until the late 1990’s, when they were converted into restaurant use. The redevelopment of these parcels was not anticipated at the time of the South Boston MHP and provisions to facilitate additional density at the property were not included in the plan, however, the state’s approval of the South Boston MHP did contemplate additional height at the location with the consolidation of developable land. With the parcels now under common ownership, and surrounded by new development, there is new interest and opportunity to revitalize the property and have it function to expand the Harborwalk network, enhance the public realm and improve waterfront access. The City of Boston foresees future comprehensive waterfront planning efforts that will be informed by the long range planning currently underway including the Imagine Boston 2030 citywide planning process, Go Boston 2030, Boston Creates, Housing a Changing City and Boston’s Climate Action Plan.